The favourite animal of the Florentine Nobles of the 15th Century, the Lowchen catered to the whims of the elite. Ladies at court clipped the hair from the dog's backs and used them as ‘hot water bottles’. Developed in Europe, the breed has been traditionally clipped similar to the Portuguese Water Dog in the lion trim (poodle look). This is probably not its immediate origin, but the similarity of the Bichon family and the water dogs are emphasised by these comparisons. The Little Lion Dog undoubtedly evolved from the family of Bichons, as they travelled from the Mediterranean into Europe. Many feel that the breed was developed in Germany, but France is listed as the official country of development. They are now recognised in many countries of the world, including Australia, but are still considered fairly rare. It can live up to 15 years of age. A bit of a clown is one way to describe the Lowchen. Its happy disposition and willingness to please makes them the ideal companion animal. Despite its diminutive size, the Lowchen is robust and full of energy, yet sensible and not hyperactive. Very good. Will accept other pets if introduced at an early age. Robust and generally sound with few medical problems, they are ideally suited to families with limited space. They do require regular grooming and exercise. 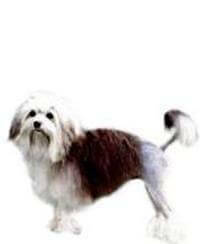 This breed is long coated and requires regular grooming and clipping. If you are seeking a loyal and charming house dog and prepared to accept the need for regular grooming, then the Lowchen might well suit you.